Unless Washington can pull off a last minute deal, the sequestration budget cuts will begin on March 1. Sequestration is the series of $85 billion worth of spending cuts that’ll ripple across the U.S. government. And across the U.S., some states are likely to get hit worse than others. In order to assess the potential regional impact of these budget cuts, we have identified those states that have the greatest exposure to federal funding cuts. We utilise the metrics calculated by the Pew centre on the States for federal spending as a percentage of state GDP. We then identify those states that are most susceptible to defence and those most susceptible to nondefense spending cuts. 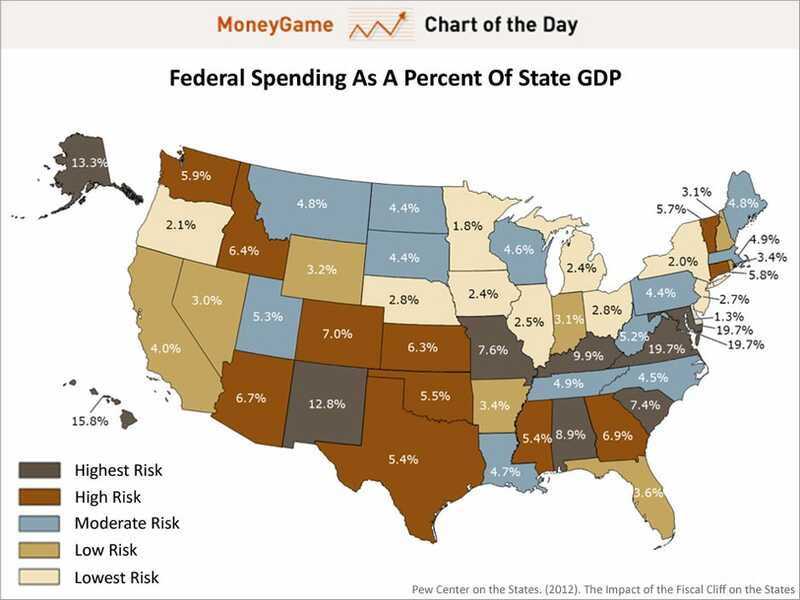 Even a cursory review of the data shows that the process of budget sequestration will harm certain states disproportionally. In general, the greater Washington, D.C. area and southern states will be the hardest hit, while states in the Midwest and along the West Coast will likely be impacted to a lesser extent.